It's little...it's Lonestar...it's "Little" Lonestar! Finally, a mini version of the ever-popular stockhorse gelding Lonestar. 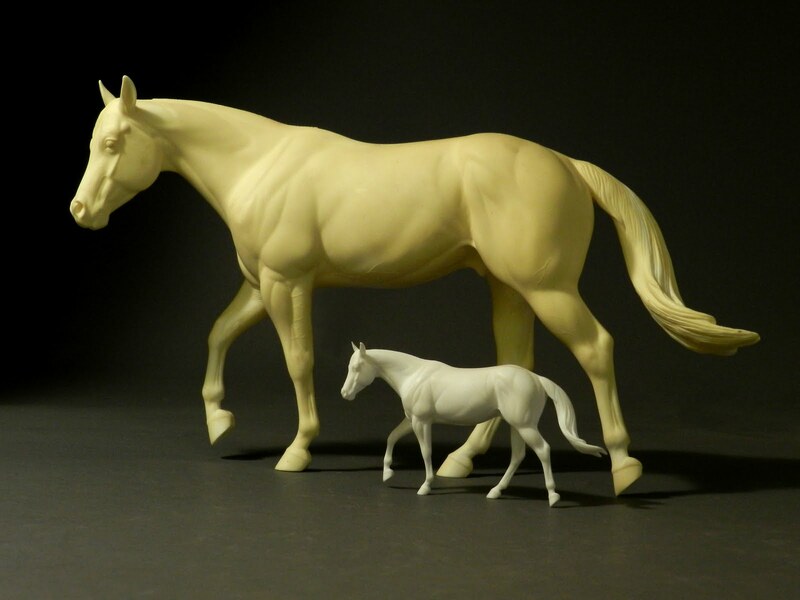 The traditional scale version was scanned by the latest in digital technology, then 3D printed in stablemate scale. Sarah has refined the print and added more definition to the musculature. "Little Lonestar" is available for an entire year, until August 15th 2012. Payments: you can make payments however you'd like after paying an initial order deposit. If you are going to be making payments a $15 deposit per casting is due within 30 days. On larger orders this initial deposit can be lowered, please inquire. Your order will go into the shipping queue when paid for in full. My PayPal email is Sarah@rosehorse.com. Shipping address for checks and money orders: Sarah Rose, 1158 Bear Creek Rd, Bayfield CO 81122. There can be a wait of several weeks to several months before we will have your order ready to ship once paid for in full. The casting schedule is dynamic and effected by how many orders we get, how many orders are ahead of your order, and other factors. 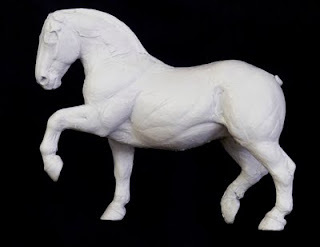 It's no secret that I haven't sculpted anything for over a year, since the reining horse. Life, or is it entropy, or both...has a way of wearing you down and distracting you from who you think you are. I *was* Sarah Rose, the equine sculptor. Lately I'm Sarah Rose the...um, what is it I am again? Health issues with myself, my husband, and most notably one of my best friend's husband's lung cancer have been like a big distraction bomb in my life. I totally lost focus on my art, and have been somewhat adrift for over a year. It's not that I never think of new sculptures, or that I never feel inspired, it's...well, it's hard to put a finger on. Lately I've been trying to fit something creative into each day, whether that is taking a few photos, trying a new recipe, or honing my digital art skills. Slowly I've been warming up to the idea of sculpting again. So, I unearthed ol' Andre from the closet, started back in '07 before the economic downturn. I thought "hey, he is almost finished, I can get him done and feel like I accomplished *something* this year." It sounds so naive now. Sculpting doesn't always come easily. 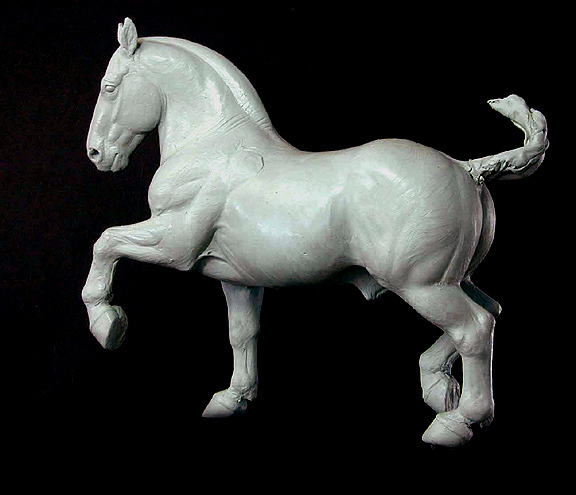 From looking at finished sculptures, mine and other artist's, it may seem that the sculpture almost made itself. That rarely happens for me, it's more of a battle that is waged month after month. 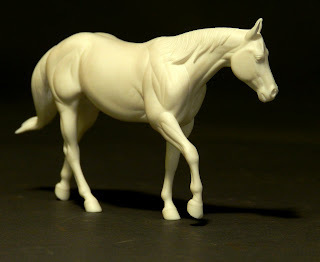 Little voices in my head saying "I hate bases, we are never doing another horse with a #$%^&*@ base again!" or "they (hobbyists) won't like him because hos breed is too vague, I need to settle on a breed, I need to settle on a type" or "what in the world have I done?". Lately it is the last thought going through my head, that and "I've completely lost my mojo". The above photo shows Andre in 2007, when I must have still had some mojo. He is full of vitality and pleasing to the eye. He isn't very breed specific, and he will need a base.